A heartfelt “Thank You” to Fox Hills Banquet Center, wedding coordinator Kristen and Alexis from Two Foot Creative and especially the bride’s family for the three propane heaters they provided us for Erin and Tim’s wedding this past weekend. The ceremony began at 6:00 so it was too cold for us to be outside without some sort of provisions. The gazebo was illuminated in the twilight with lanterns and lent an ethereal quality to the ceremony. Rev. O’Grady conducted a beautiful ceremony and concluded with an Irish Blessing. We’ve had the pleasure of playing for his wedding ceremonies many times and are always touched by his invitation to the groom’s father to introduce the couple for the very first time. You could see the pride and emotion in Mr.Schirack’s announcement! Following the ceremony, we went inside and played an hour of cocktail music. 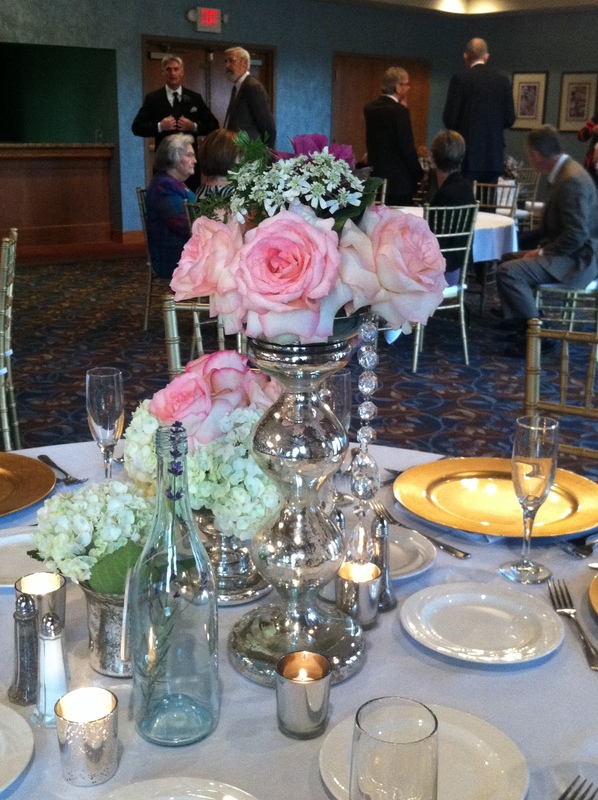 Flowers by Heidi created amazing centerpieces with just a touch of bling! While we played mostly classical music for the ceremony, we spiced it up for the cocktail hour with Bittersweet Symphony, Greenday, Coldplay and Kashmir. 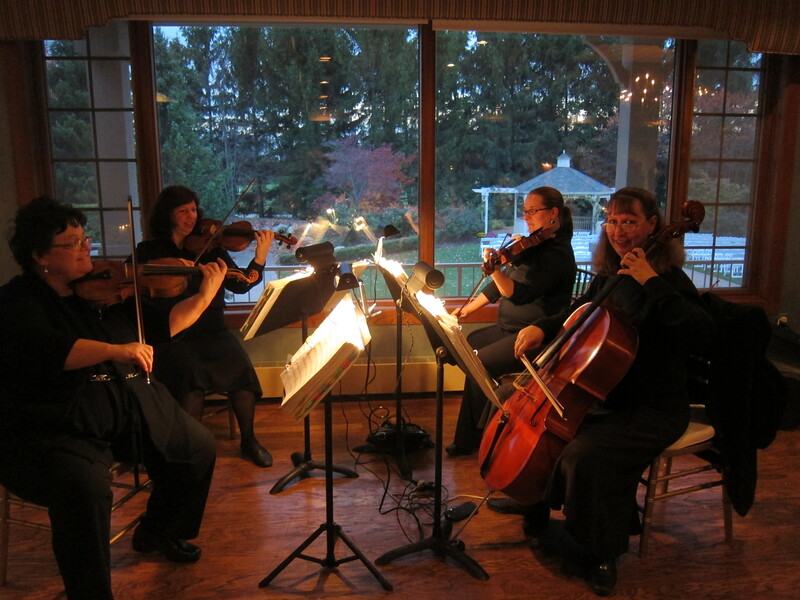 We received many encouraging compliments about our contemporary music repertoire. We love it when guests tell us that they have never heard a string quartet play contemporary music and how much they enjoyed it. That aspect of our repertoire is what sets us apart and we are always encouraged when it’s appreciated. The dinner and celebration that followed was led by Mike Staff Productions, a sure sign of a great reception. We wish Erin and Tim the “luck of the Irish” as they begin their lives together. 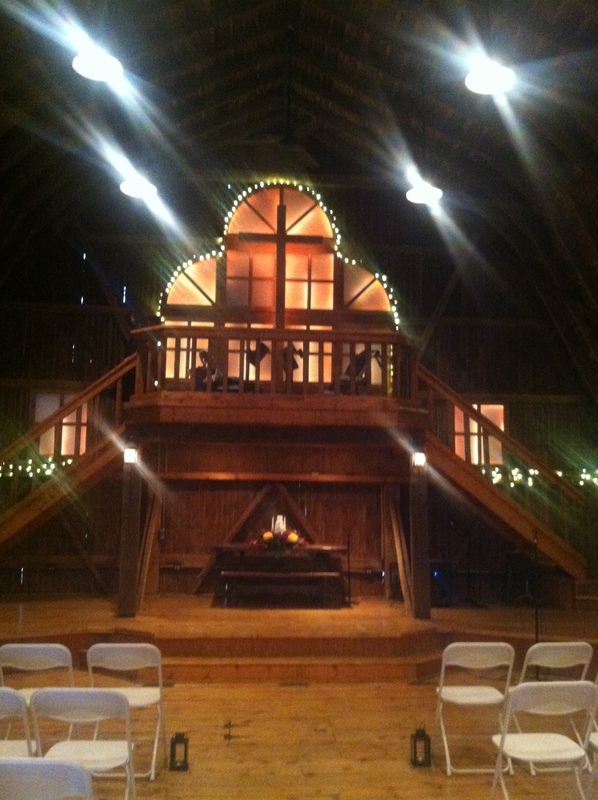 A country barn was the setting for James and Rebecca’s wedding this past weekend in Northville. The Three Cedars Farm is known for family oriented weekends of pumpkin picking and bonfires. Few would realize that that the upstairs portion of the barn has been refurbished to resemble a chapel complete with stained glass windows, balconies, an alter area and large wooden cross. It was here that Rebecca and James chose to have their wedding ceremony before family and friends. The inventive couple spent much time planning a “book wedding” and challenged us to find music that would be identified with literature. It was an intriguing task and with some research, we came up with some great songs including “Into the West” from Lord of the Rings, “Bella’s Lullaby” from Twilight, “Hedwig’s Theme” from Harry Potter and “Safe and Sound” from Hunger Games. Terry McGinn officiated the ceremony and was a great help with cues as we were located in the front balcony above the alter area. Best wishes to this Rebecca and James as they begin their married life. It was a true Michigan fall day Stacey and Ryan’s wedding at Mill Race Village in Northville. Despite the chilly in the air, the mood was one of celebration among the family and friends. The bridal party arrived with a flurry of activity, setting up chairs, taping down the aisle runner, moving tables and having a great time doing it! This was a group that “got the job done”. The six bridesmaids and one charming little flower girl, who tossed tiny autumn leaves instead of flower petals, wore deep blue gowns and walked to Canon in D. The bride had one of the prettiest gowns we’ve seen this season and processed to Bittersweet Symphony by The Verve. 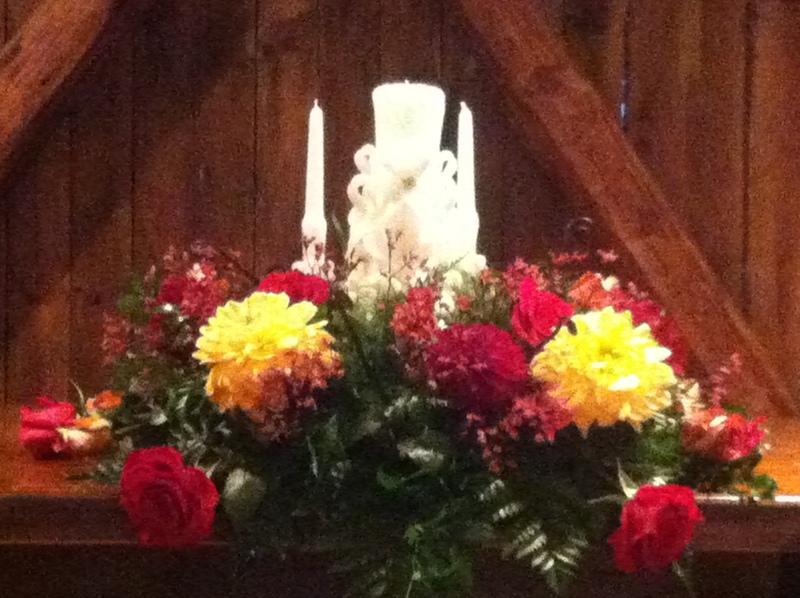 Two of the perks of an autumn wedding are the flowers and colors that can be incorporated. Mill Race Village was the perfect setting for an autumn wedding and Stacey and Ryan couple brought those rich fall flavors into the chapel. Congratulations and best wishes as they begin their journey together. 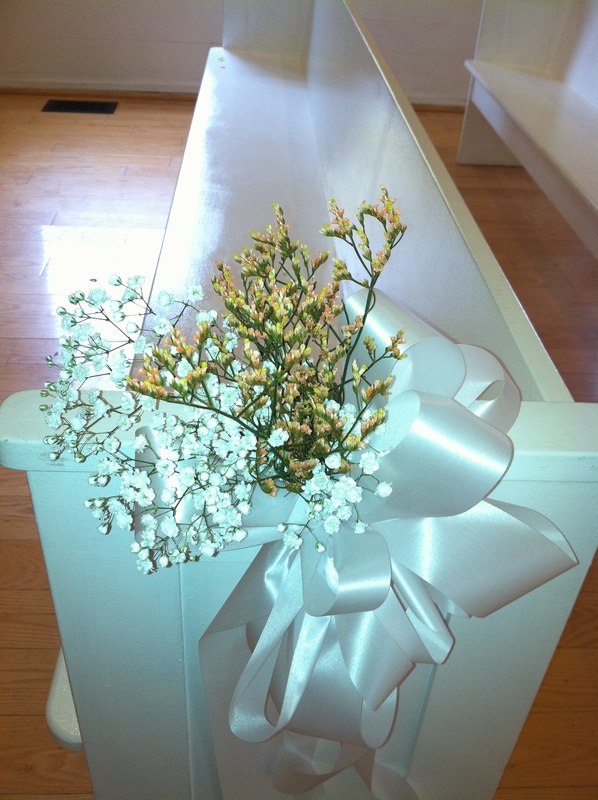 Congratulations to Sarah and Kevin who were married in the restored chapel at Mill Race Village in Northville. 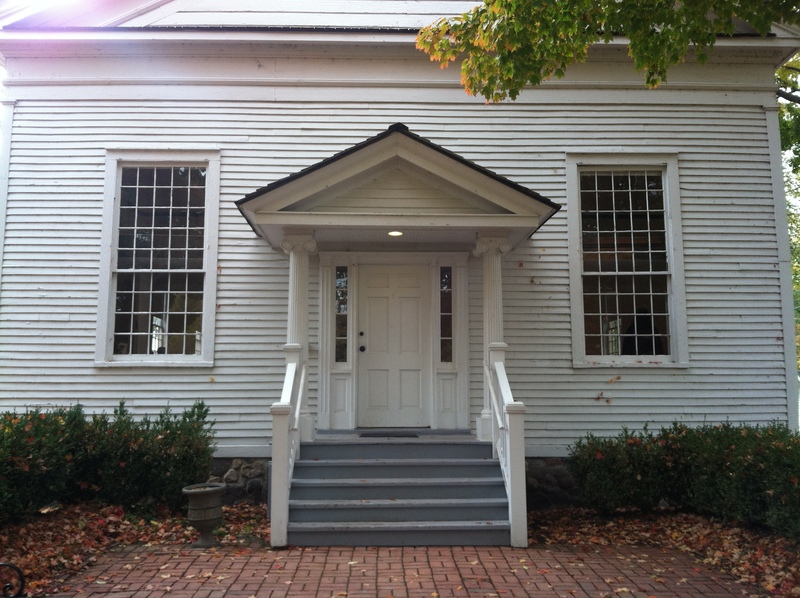 Created in 1972 by the Northville Historical Society, the village was built on 12.5 acres of land donated to the City of Northville by the Ford Motor Company. Once the site of a grist mill, the village consists of an inn, blacksmith shop, school, church, gazebo, rustic wooden bridge, Interurban station and several homes reminiscent of an era gone by. Just as the wedding was a blending of romance and reality, the couple chose a blend of contemporary and traditional music for their ceremony. Viva La Vida and Don’t Stop Believin’ welcomed the guests while the traditional Ave Maria, Jesu Joy of Man’s Desiring and Pachelbel’s Canon were incorporated in to the service. 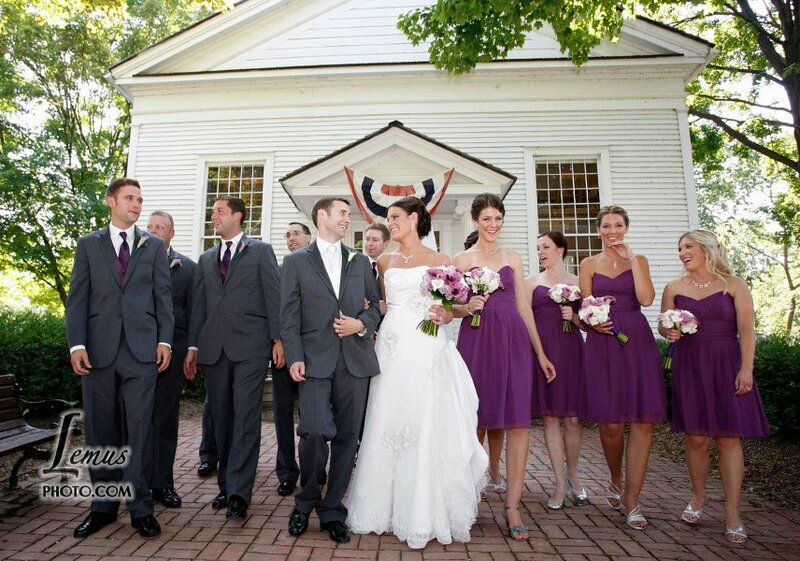 The five bridesmaids, wearing lilac street length dresses and Sarah’s elegant bridal gown were a perfect fit for the setting of the historic restoration. Special thanks to Kathy Bishop of Fantastic Functions for her help as wedding coordinator. She stayed in close contact with us throughout the week as weather concerns were addressed and was a tremendous help during the wedding itself. We wish Kevin and Sarah the very best as they begin life together. Congratulations to Laura and Matt on the wedding this past Saturday at Genetti’s Little Theater on Main Street in Northville. A landmark since 1971, Genitti’s originally started out as a meat and grocery store. In November 1979, owners John and Toni opened their restaurant when a hole was knocked out of the market’s side, giving birth to Genitti’s-Hole-In-The-Wall. Genitti’s Little Theater which is just next to the restaurant is accessible through yet another hole-in-the-wall was acquired in 1992. The wedding was held in the small historic theater complete with brick walls and tin tile ceiling. The stage was beautifully decorated with an arbor, flowers, candelabras and subtly placed crystals that caught the light. It gave the ceremony an elegant feel. The family and bridal party processed to Pachelbel’s Canon while Laura processed to Jesu, Joy of Man’s Desiring in a beautiful classic gown. The couple’s recessional was the fun “All You Need is Love” by the Beatles. Following the ceremony, the guests enjoyed a wonderful meal next door at the restaurant. To quote Genetti’s, their dinner is “like an old Italian wedding, it features lots of food, served hot”. We wish Laura and Matt the very best as they embark on married life.